Bedroom decor full of Hollywood glamour. Fabrics with sheen. Opulent finishes. Added pieces with reflective drama. Truly decadent, this gorgeous bench would be right at home on a Hollywood set. But it looks equally amazing perched at the end of a bed, snuggled up to a vanity, or adorning an entry hall. An eye-catching floral motif of ivory petals adorns this romantic bedding ensemble by Donna Karan. Handcrafted bedside chest. Asian hardwood solids. Hand-painted ombré-effect topaz-leaf finish. Custom designed ginkgo-leaf hardware. Two drawers with linen-like damask pattern decorating drawer bottoms. 44"W x 18"D x 36"T.
Handpicked for its ability to delight design aficionados, this one-of-a-kind chair always turns heads. With an upholstered interior in a soft buff colored velvet and a contrasting satin swirl fabric on the outback, this chair can blend seamlessly into any décor. Its swivel base makes it ultimately functional, while elegant finishes in Pearl and Whisper of Gold add expressive elements of style. 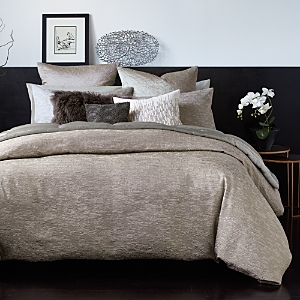 Add the Midas touch to your bed's decor with Donna Karan's Vapor duvet cover. Featuring a sophisticated burnout pattern, this cover is as soft and inviting as it is stylish thanks to its viscose-silk blend face and cotton sateen reverse side. Strike gold with Donna Karan's Vapor sham. Featuring a sophisticated burnout pattern, this sham is as soft and inviting as it is stylish thanks to its viscose-silk blend face and cotton sateen reverse side. Decorative pillows Wall art made of oxidized aluminum and natural brass. Lamp made of metal. Hand enameled and hand set with Swarovski® crystals. Shade made of rayon and polyester. The Bittersweet Collection by Michael Aram is inspired by warm yet vibrant hues and features printed velvet designs with coordinating shams and pillows for a sublime sleeping experience. Handcrafted chair. Alder wood frame. Polyester velvet upholstery. Handcrafted shadow box. Oxidized aluminum and natural brass. Reversible duvet cover. Viscose/cotton/polyester. Sham is made of viscose/silk/polyester. European sham of striped silk. Flange finish. Silk/cotton sham with viscose medallion embroidery. Flange finish. Curtains and decorative pillows complete the look. The tops and sides of this credenza have inset black glass panels while the doors are reverse hand-painted black glass in a stylized honeycomb pattern using different shades of gold to add contrast and texture. Two-door chest. 40"W x 19"D x 36"T. Two doors; one adjustable shelf. Made of Asian hardwoods with a dark and metallic champagne finish; back of chest is painted black. Metal hardware with a champagne finish. Duvet cover and shams of 300-thread count cotton sateen. Sheets made of 400-thread count cotton. Decorative pillows Giclée reproduction on canvas, artist-enhanced with hand-applied gold leaf. This art combines the aesthetic of gold leafing with painterly forms to create a stunning and gestural portrait. The framed canvas is designed with a gold floater frame. Resin, faux bois driftwood table lamp with silver leaf finish. Approx. measurements (total): 30.5"H x 9.5"W. Open cone shade in white linen. Floral duvet with solid border. Textured silk quilt. Linen sham. Layered flange. Sham with flower embroidery. Sheets made of 400-thread count cotton. Beaded decorative pillows Derek Shaw is inspired by the sights and sounds of his hometown, Chicago. Animated by a sense of curiosity and adventure, the Windy City is rediscovered through his vivid brushwork. Three-drawer bachelor's chest. 33.875"W x 17.75"D x 32.25"T. Inset, antiqued, mirrored-glass drawer fronts. Flat-cut white-oak veneers with weathered finish. Create a beautiful and unique bedroom decor with the Aire Bedding Collection from Donna Karan, featuring an abstract pattern, reminiscent of watered silk or a delicate watercolor painting, and the smooth touch of a cotton fabric. Handcrafted fine-art giclée. Set of 3; each, 22"W x 2"D x 42"T. Canvas, with hand-applied, textured finish to recreate the look and feel of an original oil painting. Polystyrene frame. Handcrafted bench. Alder wood frame. Cotton upholstery. Accented with nailhead trim and round mirrors. Put a luxurious five-star finish on any room's decor with the richly-textured ombré jacquard and sparkling metallic accents of the Opal Essence bedding collection from Donna Karan. The coordinating decorative pillows and quilted throw complete the look with brilliant pops of gold. Reproduction of original by Austin Biev. Hand-embellished giclée on canvas with metallic gold accents. Wood frame with golden finish and black inner detailing. Framed without glass. Three-drawer chest has antiqued mirrored veneers and antiqued golden trim. 43"W x 19"D x 35"T. Made of Asian hardwoods and glass. Sconce designed and created by hand; signed and dated by Tommy Mitchell. Made of copper, brass, and steel. Gilded brass finish. Add a touch of texture and contemporary style to your bedroom décor with the crepe jacquard and clean ivory hue of these Rhythm duvet covers and shams from Donna Karan. Handcrafted faux-floral arrangement. Bamboo armature. Poly silk Phalaenopsis orchids. Create the bedroom of your dreams with the Vapor Bedding Collection from Donna Karan, featuring a textured fabric in a luxurious gold dust ground. Mirror-framed mirror. Frame is antiqued; mirror is beveled. Antiqued beading trim. Hollywood glamorous, this swoop-arm chaise invites resting, relaxing, reading, daydreaming—wherever the mood takes you Evoking a sense of glamour, the Donna Karan Gilded Bedding Collection presents a glimmering mélange of woven jacquard patterns, ornate details and rich gold tones. Handcrafted giclée on canvas. Brush-gel finish. Wood float frame; framed without glass. Midwestern artist Dawn Sweitzer believes a home should be a luxurious reflection of the people and objects that bring one joy. With that in mind, she infuses each of her contemporary pieces with the techniques she learned while living and traveling through Russia and Europe. Finish your modern bedroom décor with the shimmering style and superior comfort of the Donna Karan Home Reflection collection, featuring luxurious materials and shiny gold-dust tones. Handcrafted dresser. Poplar solids, birch veneers, and mirrored glass. Gold-leaf and antiqued-mirror finish. Nine drawers. Top left has drop-in felt; top right has a removable felt jewelry tray. Mirror with twig-and-branch motif frame. Cast aluminum with shaped metal accents. Hand-painted golden finish. Old Hickory Tannery Battista Chaise Donna Karan Surface Bedding Collection Petrichor I and II, 30" x 43"
Three-drawer chest is made of composite woods and mirrors. Upholstered bench. 56"W x 20"D x 18"T. Oak frame; polyester upholstery. Mortise-and-tenon frame construction. Romantic patterns of ivory petals adorn the face of Donna Karan's Aura Collection, calling to mind a painterly watercolor that catches the eye. The harmonious relation of matte and shiny yarns makes the ivory glow.